Listing courtesy of Maggie Oreck (CalBRE #01352758), Rodeo Realty. NEW PRICE! 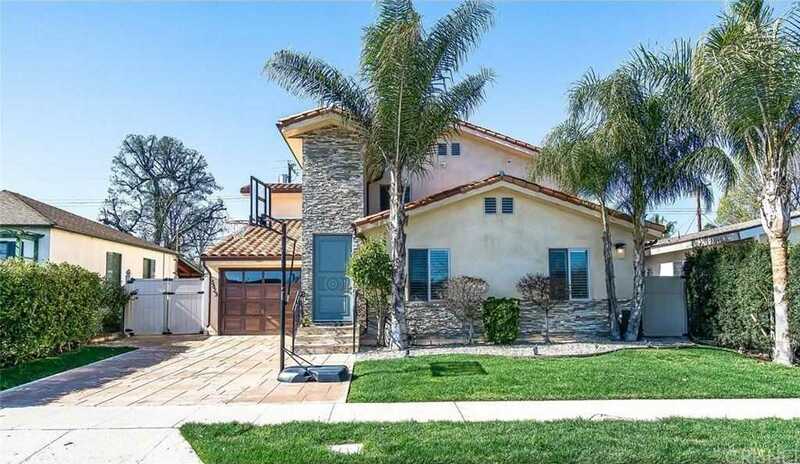 – Newer construction Encino Park Jewel with an open floor plan with 3 bedrooms, 3 bathrooms, wood floors, plantation shutters, copper plumbing, granite counters, high ceilings (9 Feet+) and recessed lighting. Gourmet chef?s kitchen with stainless steel appliances, smart refrigerator and farmers sink. One bedroom and one bathroom on the main floor. A master bedroom with a fireplace, luxurious bathroom and a balcony overlooking the backyard on the second level as well as another bedroom with ensuite bathroom and a bonus/office room attached to the laundry area. Dual A/C systems, solar panels (PURCHASED) – Smart Home! (Light switches, sprinkler system, thermostats, doorbell, front door lock, garage door). Backyard with a luxury outdoor kitchen, a swimming pool, and a lavish landscape.Easy access to the 101 and 405 freeways. Perfectly situated, close to the Orange Line .and all that Ventura Blvd. has to offer. Building size: 2674 sq ft.